Since I’ve taken up eating a salad for lunch practically every day now instead of a full-meal bento, I really haven’t had much to post, so I figured little tutorial videos for bento components would be a great thing to add to Adventures in Bentomaking. Earlier in the year I received a batch of items to review that I never ended up having time to do. 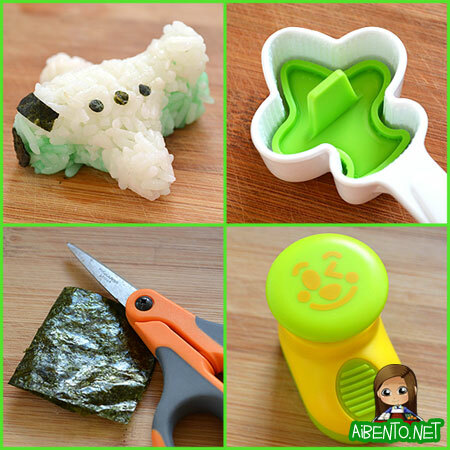 I’ve used the airplane from one of the items, the Boy Onigiri Shaper set, to make this video. Coloring the rice – Add 1 drop of desired food coloring to 1 tsp of water. Drip the mixture into your rice as needed, being careful not to add too much water. You will not need the whole teaspoon of color mixture unless you use about a half a cup of rice. Cutting the nori decorations – I used one of my emoji punches for the mini windows, but you can use any small hole punch. I just cut the pilot window and plane tip with scissors. Make sure you wet your airplane mold before putting the rice in or it could stick to it and not want to come out! Feedback is appreciated! A common complaint I got on past videos was soft audio, so I recorded myself afterward and added some music to the background.